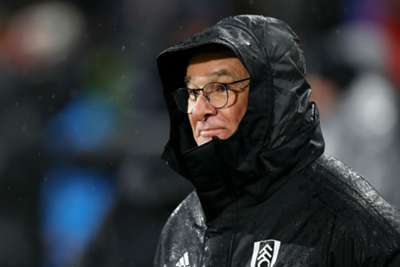 Claudio Ranieri insists it is crucial Fulham stick together and stay positive despite another tough defeat at home to West Ham. The Cottagers created chance after chance early on in Saturday's late Premier League game, but they failed to find a way past Lukasz Fabianski before Robert Snodgrass and Michail Antonio scored for West Ham to secure a 2-0 away win. Although Fulham remain bottom of the table, Ranieri was keen to point to a promising first-half performance in his search for positives. "It's unbelievable. I think we played a very good first half," Ranieri told BT Sport. "We created chances, we shot at goal, by the end, 16 times. "But [West Ham] have very good qualities and experience. On two transitions, they scored twice. For us, it was difficult in the second half. We showed very good will and we tried to do our best. That's it. "We have to stay together and continue to work. Only if you stay together and be positive can you make something good." Fulham face Newcastle United next, followed by games against Wolves and Huddersfield Town, leading Ranieri to conclude that there is no use worrying about the January transfer window yet. "It is too early to speak about what we can do in January," he added. "Now, we have this team, so we have to do our best with this team." Things are looking more positive for West Ham, who are within two points of sixth-placed Manchester United ahead of the Red Devils' trip to Liverpool on Sunday. The Hammers have won all four of their matches in December, scoring 11 goals in the process. West Ham boss Manuel Pellegrini said: "The result we are trying to reach is not easy because we are still recovering from that bad start that we had to the season. At the moment, we are two points behind sixth. "We will see what will happen tomorrow with United against Liverpool, but really we must go game by game to try to improve what we are doing. It is not easy to change so many things, but I think that the team is in the correct way." Goalscorer Snodgrass added: "You've got to take each game as it comes. You can see there's great competition in this league this year, so we'll just take it one game at a time. We'll enjoy the moment. "Four wins on the bounce is good, but we're working on the training ground to try to get into the top 10 and mix it with the big boys."